Learn about RethinkDB’s database software for businesses. Includes info on RethinkDB, free trials, pricing, customer reviews and FAQs. 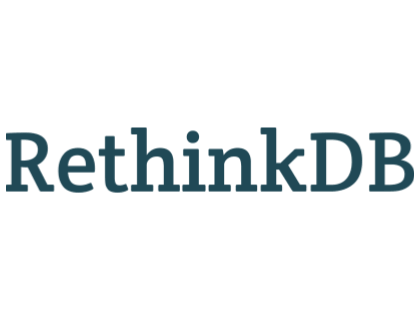 RethinkDB is a free database platform for businesses. RethinkDB’s solutions include streaming analytics, realtime marketplaces and multiplayer games. Businesses can use RethinkDB to build real-time apps effortlessly. RethinkDB’s software is completely free. You can access it here. Pros: Excellent automatic replication and sharding features. Bottomline: RethinkDB is a quality, scalable and easy-to-use database. Is there a RethinkDB free trial? RethinkDB’s software is completely free. Where can I find the RethinkDB login? There is no login capability on the RethinkDB website. You will acquire login details once you have registered for their products. What are some RethinkDB alternatives? I found that working with RethinkDB is actually a pleasure. All of its developer-facing parts are well designed and, so far as I could tell, bug free. ReQL is an interesting and powerful query language. It will be a while before the RethinkDB team works out the technical kinks, people start using it at scale, the inevitable failure reports start rolling in, and once again the RethinkDB team works out the kinks. Until then, it’s way too early to recommend this database wholeheartedly. What I can say is that I’m looking forward to using it on future personal projects, and I’m excited to see what the future holds for RethinkDB. I used RethinkDB in production for many years. The past year I switched everything over to PostgreSQL for the JSON column support as well as geo spatial indexing. After making the move my main reaction was “I wish I had done this sooner!” The PostgreSQL community is quite large and far more competent that Mongo’s.I’m thankful for the RethinkDB team as the product helped me dive deeper into the DB side of the stack. Feel free to DM if you go the route I did. RethinkDB is mostly used for real time Web in an open source database. Clustering is supported by RethinkDB which makes it easy for scaling. So it is one of the best open source database for real time web.